I knew I wanted an A line dress with either an illusion top or straps. Other than that, I was pretty open to trying on different styles of A-line dresses. I knew I wanted something comfortable, and that I could dance in and not have to worry about constantly adjusting. I also wanted to have my dress fit the venue. 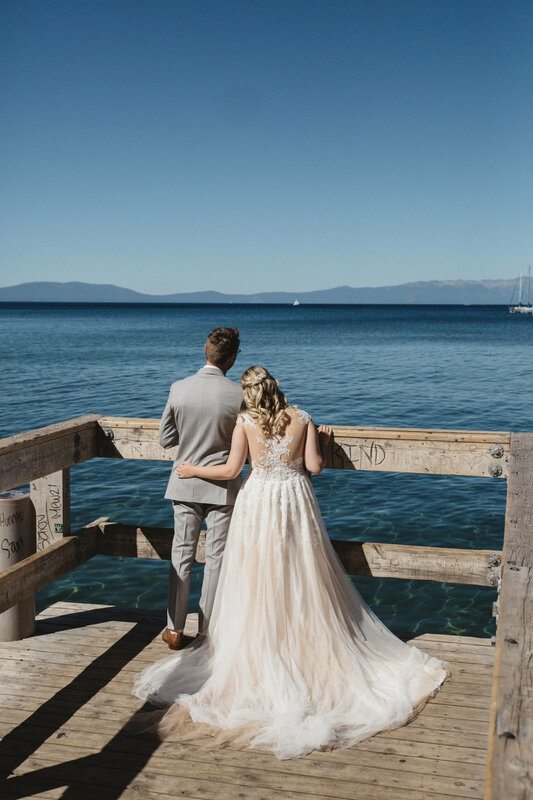 I was getting married in Lake Tahoe so I wanted to make sure the dress was cohesive. How did you know that you found “the dress”? I was torn between two very different A-line dresses. One was more glitzy and the other was more whimsical. I went back into B2BC by myself and tried on both dresses again and knew the whimsical dress was the one. It was so light, comfortable, fit with the Tahoe theme and the sheer back detail was so striking. I recommend every bride make an appointment at B2BC! It's such a warm, friendly and intimate atmosphere. 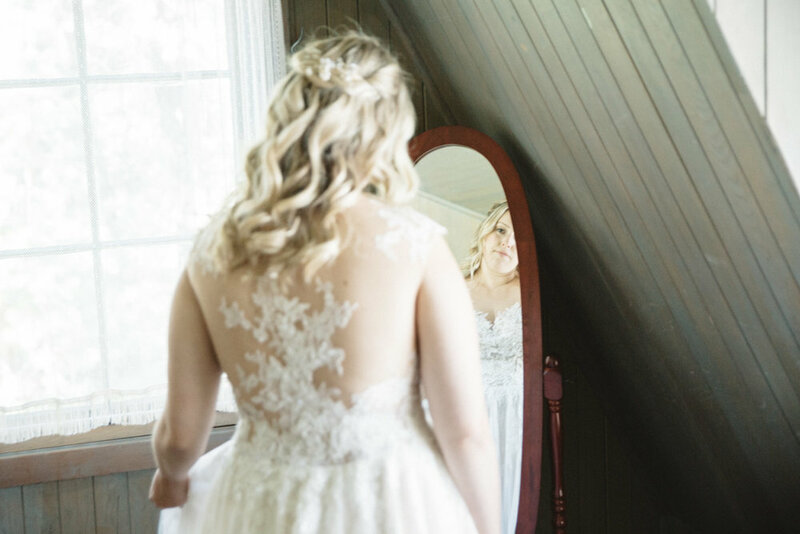 Erin, my consultant was so patient with me and listened to my style. She was super knowledgeable about each gown and what could be changed/altered. When I couldn't decide what dress to pick, she told me to come back 2 days later and she would pull them again for me to try on. It really helped and I made the right choice! Don't bring a lot of people to your appointment. It makes things confusing! Be open to trying on different styles, it will help you eliminate options or you may surprise yourself! Don't count out a dress because it's not perfect from when you try it on off the rack. The size probably isn't right and you can make custom alterations to almost any dress. Ask your consultant! It made a world of a difference for me. Finally, don't forget about cost of alterations. If you have a budget, make a cushion for alterations (more than you think!) so you aren't stressing about going over. There are so many amazing dresses at all price points!